STREAMLINE YOUR PITCH BOOK INTO A DYNAMIC DIGITAL EXPERIENCE. Dewuta Presenter is the ultimate sales tool; bringing all your resources together into one personalized app for a flawless sales presentation every time. SIGN CONTRACTS DIRECTLY ON YOUR TABLET, NO MORE CARBON COPIES. Dewuta Documents compiles all your contracts and forms into one app so you have everything you need to close the deal right on your tablet computer. GIVE YOUR CUSTOMERS THE MOST ACCURATE ESTIMATES POSSIBLE. 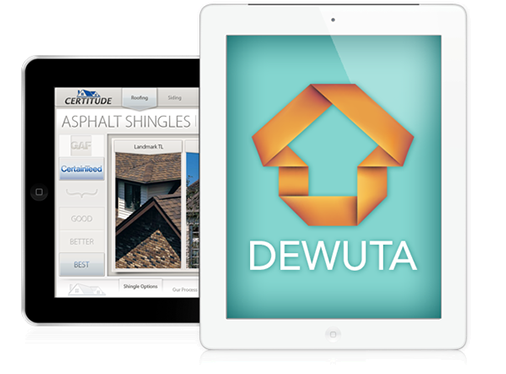 Dewuta Estimates is the perfect technology for contractors to give their customers quick, easy and extremely accurate estimates, with all the details included. CUSTOM SOFTWARE SOLUTIONS FOR CONTRACTORS BY CONTRACTORS. Revolutionize the way your company sells. Stand out from the crowd. Connect with customers. Close more deals. All with our essential apps, designed specifically for contractors. Copyright © 2014 DEWUTA. All rights reserved.